In trained persons the latissimus dorsi muscle is responsible for the beautiful V shape of the back. But if it is tight or contains trigger or tender points, it may be your source for mid back and lower shoulder blade pain. 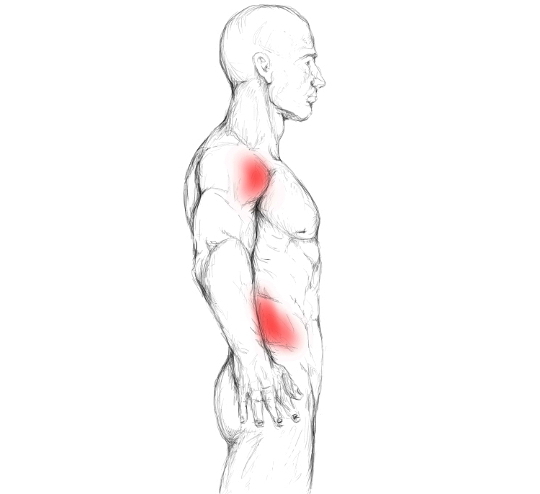 When trigger points are present in your latissimus, they can give you pain right at their location and send pain to other, seemingly unrelated areas of your body. The upper trigger point – X1, shown under “Attachment Points” – very often may give you a painful lower shoulder blade and mid back pain. Furthermore pain can radiate over your shoulder blade and down the backside of your arm till it reaches your 4th and 5th finger. Although not shown in the pictures, you also could experience pain at the inner side of your arm and hand – also 4th and 5th finger –. The lower trigger point – X2 – mainly sends pain to the front of your shoulder and to the side of your body just above your hip. The darker the red in the pictures below, the more common it is that you experience pain in those areas when trigger points in your latissimus are present. 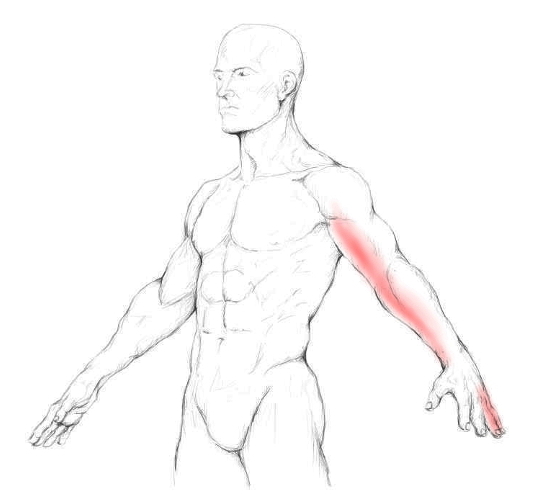 Usually, tight muscles that contain trigger or tender points, impair certain movements or make them painful. Mostly those movements are the ones where the muscle has to work/shorten or the ones where it gets stretched. The latissimus however is somewhat special here. It will not give you too much trouble while using it, even if it is tight or has trigger or tender points. This way you might not really feel that something is wrong with this muscle. If there are any movements that may be painful, then those are the ones where you reach in front and above – thus stretch your latissimus –. The latissimus dorsi muscle is pretty big and covers quite some surface on your back. It consists of three parts that all run into the same direction/attachment point. All three parts run to the tuberculum minor at the humerus, which is located at the upper front of your upper arm. This latissimus dorsi muscle has quite some functions. It adducts your arm, extends your shoulder and rotates it inwardly. Because it is such a powerful adductor of your arm it helps to compress your thorax/chest when coughing – both, the left and the right lat contract –. Here, especially movements are to mention that involve heavy pulling or throwing. But also if you are not an athlete involved in the sports mentioned above and have pain at your mid back and/or lower shoulder blade, you might want to check your latissimus for tender and trigger points. If your pains are coming back again and again, you might be wondering why. Beside the info I have just given you, you need to know the basics on how trigger points work, as well as why and how they develop. This will help you a great deal relieving your pain. For this reason I offer you a free online course that will teach you exactly that. I hold it together with Dr. Kuttner, the guy you can see in the picture. The course comes with videos which will open your eyes and are complemented by an easy to read PDF. You can get both by cklicking on the button above, right under the video. 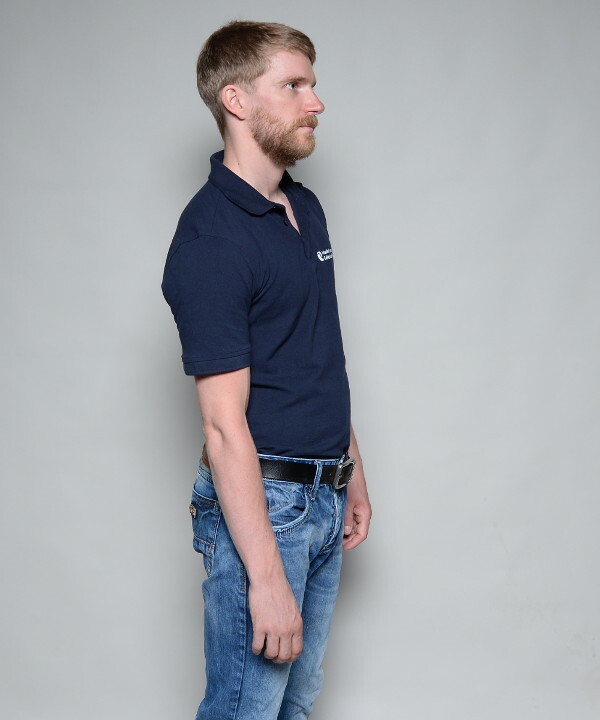 The latissimus dorsi muscle is a real no brainer as it is so big that it is nearly impossible to miss it. Just let your arm hang loose and then press it against your body. 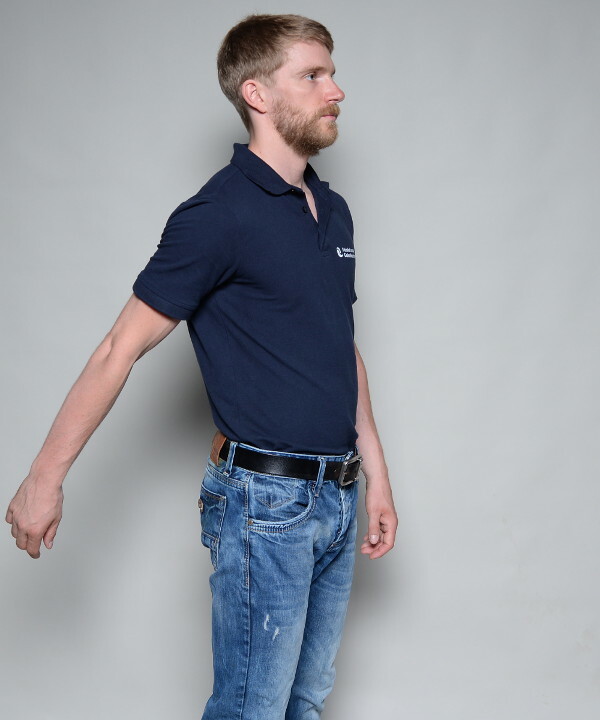 Keep up the tension and feel with your other arm the latissimus dorsi, especially at the height of your upper arm. 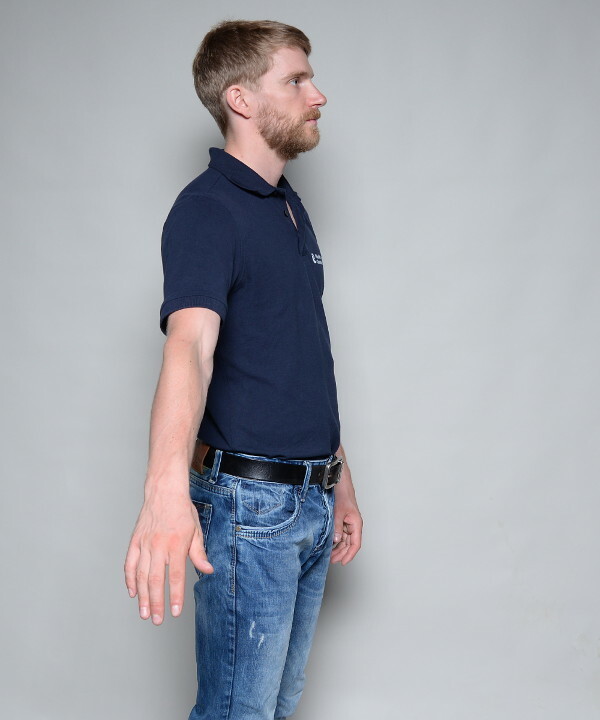 Slowly move your hand up and down, from the hip to your upper arm and try to feel where the muscle runs. You can use your hands or a ball for massage. 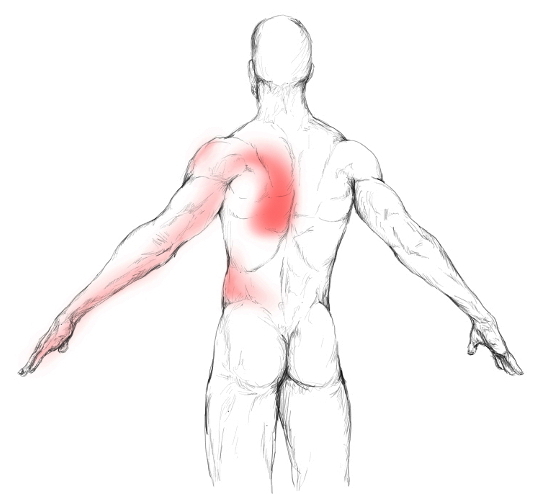 For massaging your latissimus with your hands, pinch it and search for tender or trigger points. When you encounter one, roll it slowly between your fingers. But be aware of not overdoing it here. Your hands have to work hard on this one. 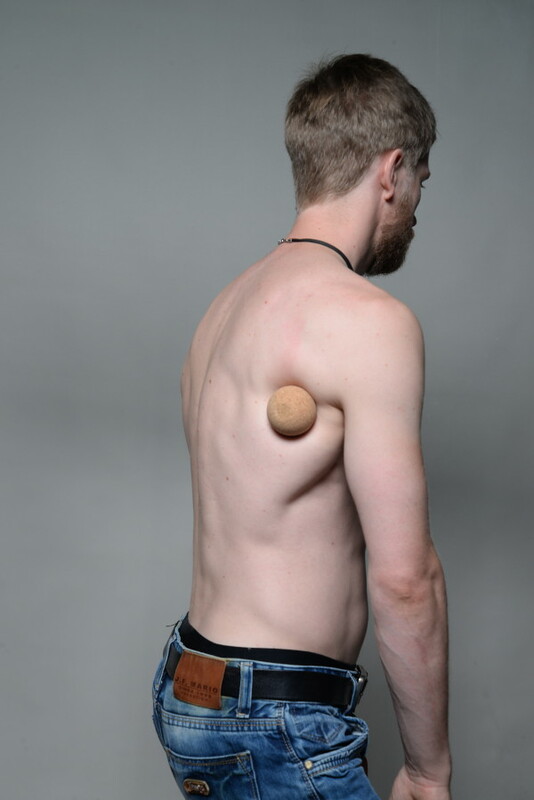 It might be a good idea, to massage it first with your hands for a short time and then switch to the massage ball. I heavily recommend not stressing your hands too much as you might strain them. There are mainly two areas that are often tender. Namely the outer border of your shoulder blade and the area of your lower ribs. 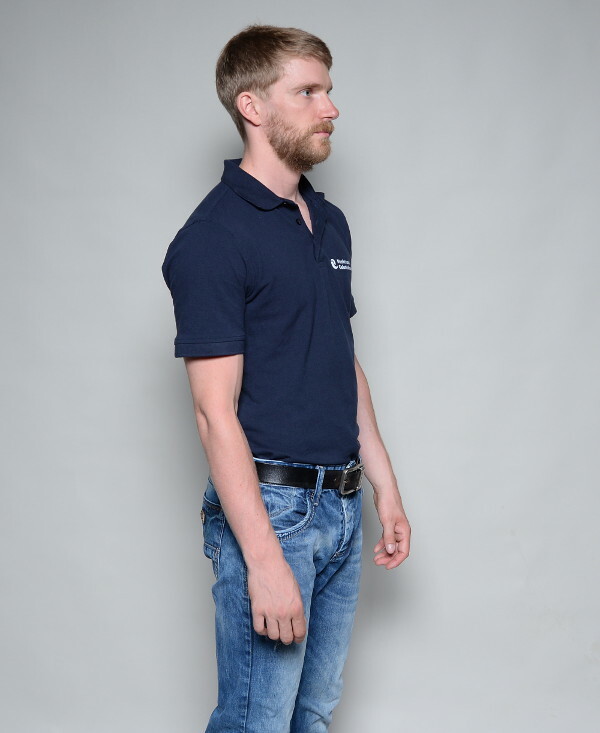 Place the ball on the desired area and lean against a wall. Now slowly roll over the area and seach for tender muscle tissue. Massage each of these with a couple of slow massage strokes. Self-massage at the outer border of the shoulder blade. Self-massage in the area of the lower ribs. … to learn more about trigger points? … and how to switch them off forever? Yes? Then you might want to sign up for the free trigger point course video series.